Posted by ben166 in Uncategorized. Its been a year. I dont even know where the dream went. I dont know but I lost intrest bye. I might do Some x-box halo and WWe stuff on here but I will still keep my old stuff. Well I guess the last time I use this sign off. Hey. In the new ninja catolog there is a new white chi. Here is a pic. Here is the new tea table picture. In the new sports shop catolog there is all new baseball stuff. If you click the ref you will get a gren baseball suit. And here is out to get the red cap. And dont for get you can buy the special game items next to the game. Like the surfoard next to the catchin waves game. Oh. And here is the new pin. Well thats it. Do you like my new logo? Comment yes or no. I FOUND AUNT ARTIC!!! SHE ONLY GOES IN THE BACKSTAGE I SAW HER ON HIBERNATE. oTHER SPECIAL GUESTS ARE ROCKHOPPER, CANDENCE, GARY, AND THE PENGUIN BAND. HERE IS A PIC. Hey. Here is all off the new stuff. First lets look at the stage. There are some free items here they are. First Click the award for the backgorund. Then click the weird thing for the hat. Here is how to et to the backstage/Dressing room area. Now for the ice sculptures. This is my favorite one. For some reason I just love this one. And now for the igloos. Here is the new furniture catalog. And here is how to get a white puffle poster. 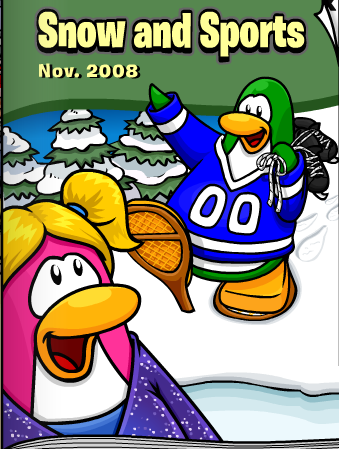 Here is the igloo catalog. And here is the new igloo. It is a restaurant igloo!!! Here it is. Well thats pretty much it. Bye. I am so glad im back. This is so much fun. The ST Patricks day party 2009 is here! There is one free item and one member room/item. Here is some pics. Here is the new pin!!! Here is the free item in the coffee shop. Its the old hat. And here is the way to the member room. Its am tree house. Inside is an accordian. Hey I am back!!!!!! I am sorry I was gone. But school and videos and cp i just couldnt take it. So I did’nt blog. NOW AFTER 9 LONG MONTHS THE RETURN IS UPON US. I AM BACK BABY!!!!!!!!!!!!!!!!!!!!!!!!!!!!!!!!!!!!!!!!! The only reason I posted sometimes was too keep people comming here. But I still play CP. Ill post updates tomorrow. Look i saw a orange puffle!!! Here it is sorry i can only post one im in a rush. 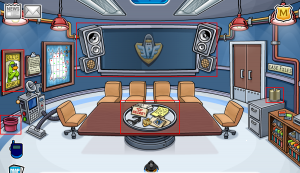 Hey heres a pic of the room on cp. But u need the new cp game to get in. Hii Fox AKA Gisselep… on me and dannion party.